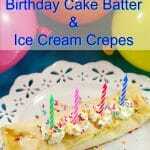 You are here: Home / Recipes / Breakfast and Brunch Recipes / Birthday Cake Batter and Ice Cream Crepes: Birthday Breakfast! I’ll admit that I was a little horrified the first time my daughter told me that she had ice cream for breakfast. She had come home from a sleepover birthday party at a friend’s house and when I asked what they had for breakfast she replied, “ice cream cake,” a little too matter-of-factly for my liking. So I let her do the same thing the morning after her 11th birthday party sleepover. 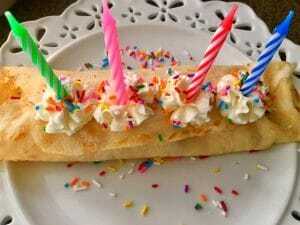 And I even put the ice cream into these birthday cake crepes I made because well, it was her birthday and life is short! AND given the occupation of the mother that let the kids have ice cream cake for breakfast, I felt pretty justified. Sometimes you just gotta eat ice cream for breakfast, especially when it’s your birthday! Cake and ice cream are simply a match made in heaven. That’s why I made cake batter flavored crepes, put ice cream inside them, covered them lots of sprinkles and even used whipped buttercream icing, instead of whipped cream. I figured if you are going to go for it, then go all the way! Ice cream isn’t your typical crepe filling, but it’s the BEST filling for these cake batter crepes. And therefore, I use the best ice cream. Chapman’s ice cream happens to be my favorite (this post is NOT sponsored by Chapman’s) But if you can’t get Chapman’s (it’s Canadian), then use a high quality, vanilla ice cream with natural ingredients. 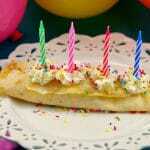 As far as breakfast crepes go, ice cream filling is a dream come true- especially for a summer birthday breakfast! 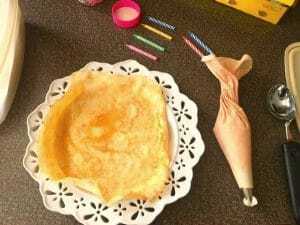 If you have never made a crepe before then WATCH THIS VIDEO! *The trick with making crepes is that you need to use a hot pan, and turn the pan (like you would for an omelette) and move the liquid until it spreads over the entire pan. 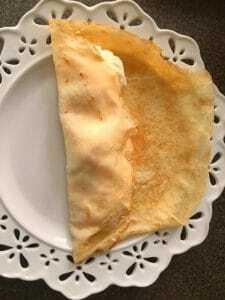 AND… if you’re not sure how to fold a crepe then see my directions in the recipe or CLICK HERE to see variations. Given that the Mom that let the kids have ice cream cake for breakfast was a Dietitian, I really didn’t feel too bad about my decision to feed my daughter and her friends ice cream for breakfast on her birthday. In fact, I felt pretty darn good about it! I only wish I had this for my birthday when I was a kid! Whether or not the ice cream cake for breakfast story is even true is inconsequential because I was just looking for an excuse anyway. And since I tend to live vicariously through my kids…ice cream for breakfast it is. 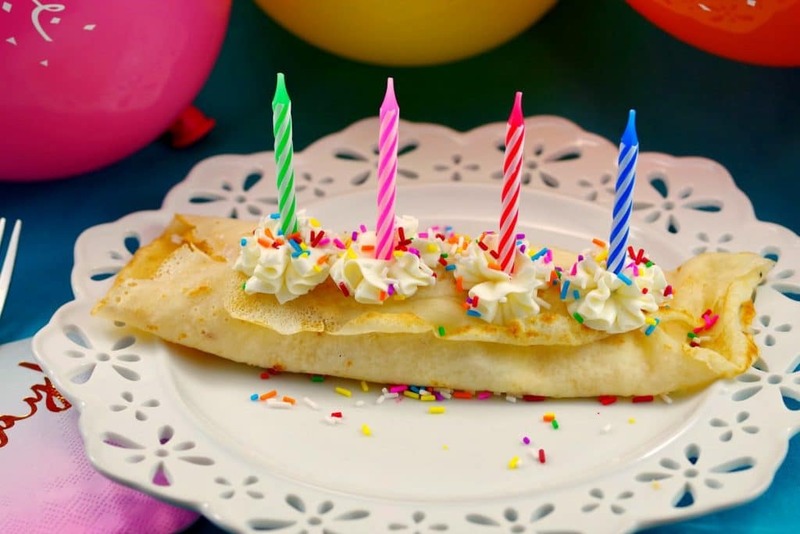 So, if you really want to P-A-R-T-A-Y on your birthday and/or make your kids’ birthday breakfast dreams come true, make them these Birthday Cake & Ice Cream Crepes. 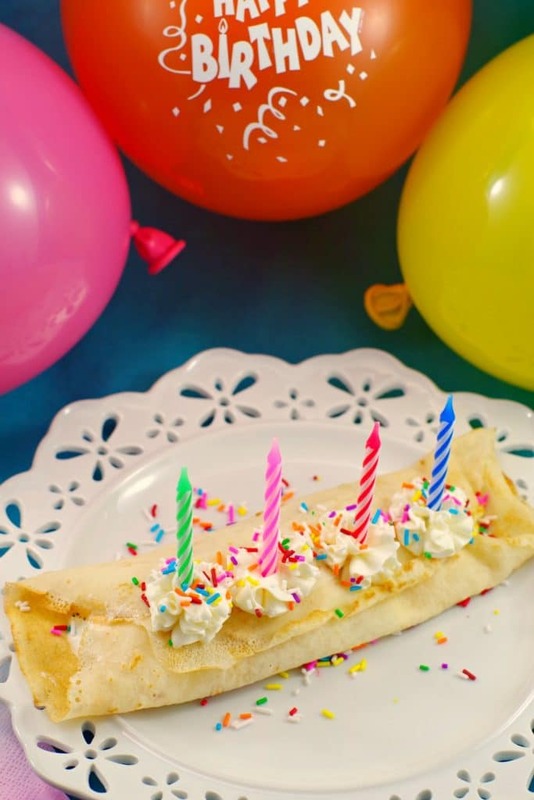 These Birthday Cake & Ice Cream Crepes are ideal for a kids’ sleepover birthday party but they are really perfect for any birthday breakfast celebration! 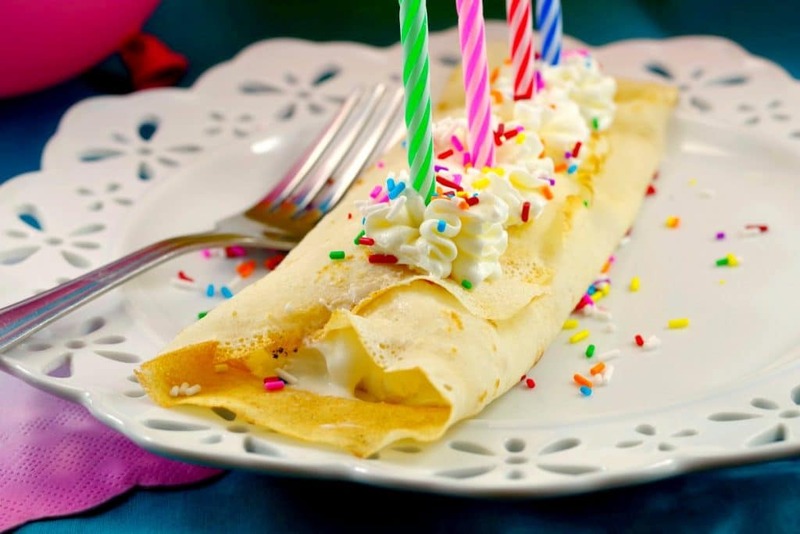 These Birthday Cake Batter & Ice Cream Crepes taste like birthday cake, filled with ice cream and topped with whipped frosting and loads of rainbow sprinkles. They are the perfect birthday party sleepover breakfast for kids or birthday breakfast for anyone that really wants to PARTY on their birthday! 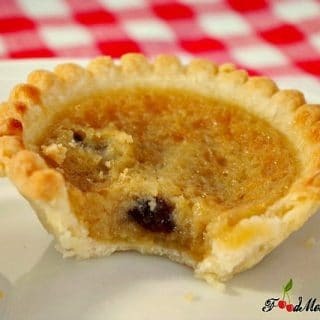 Combine flours, egg whites, milk, orange juice, cake batter extract and oil in a blender or food processor. Blend until smooth. Allow crepe batter to rest for 5-10 minutes. Spray an 8-inch nonstick skillet lightly with cooking spray. Heat over medium-high heat until hot. Remove skillet from heat and pour 1/4 cup batter into skillet, tilting skillet in all directions to evenly cover with batter (see video in NOTES). Cook until edges start to brown and batter sets in center ( about 30 seconds – 1 minute). 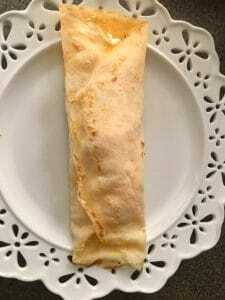 Carefully lift edges of crepe and flip with spatula. 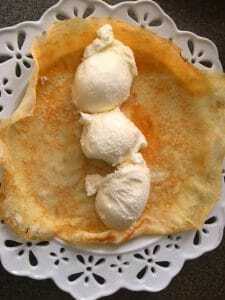 Cook for another 30 seconds – 1 minute or until crepe is lightly browned. 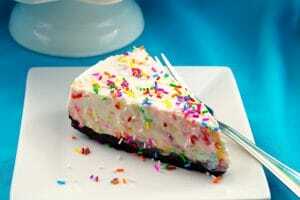 Pipe buttercream or whipped cream, add sprinkles, then add candles.